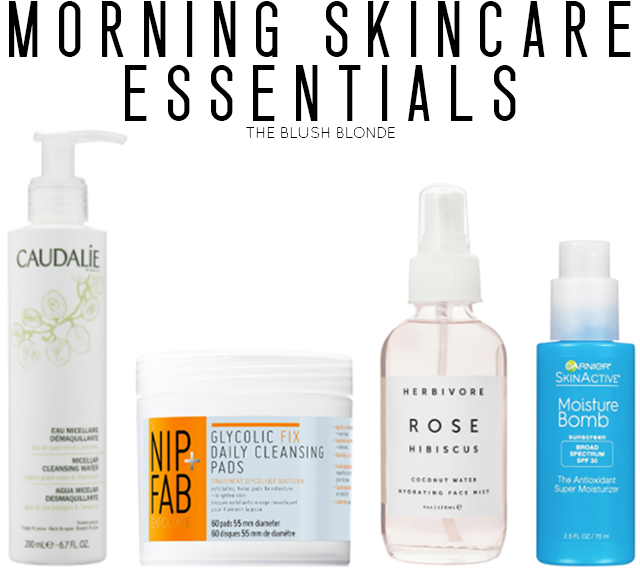 I am so not a morning person and because of this I like to keep my morning skincare simple. While I prefer simplicity in the morning that does not mean that I skimp on skincare by any means. These are the products that I use every day whether or not I'm wearing makeup and they prep my skin for both a bareface and makeup. Below I'm sharing the details on each of them. My skin is very dry so I prefer to use micellar water in the morning. Micellar water gently removes impurities from skin without drying it out, which makes it perfect for my skin. I just put a pump of this on a cotton pad and swipe it over my face, neck, and hairline to cleanse my skin. If you're looking for a more budget friendly version try this or this (I've tried and like both of these!). I use one of these pads after cleansing with the micellar water. These exfoliate skin with glycolic acid and tone it as well. In addition they add moisture with hyaluronic acid and give skin a nice glow. These are a dupe for these, which I ran out of so I picked up this less expensive version at Ulta, while waiting for my order from Sephora, and was happy with their performance. This facial spritz combines coconut water, hibiscus petals, and rose petals to refresh tone and hydrate skin. I spritz this on before or after moisturizing, whenever I remember, to give my skin a hydration boost. I also love this facial spray. I recently started using this moisturizer in the mornings and really love it. It's very hydrating, but also lightweight, which can be hard to find in a moisturizer with an SPF of 30. It also contains vitamins and antioxidants to further protect and nourish skin all day. If I'm having a makeup free day I simply go after these four simple products. If I am wearing makeup though I further prep my skin with this primer and then use this CC Cream, which also has skincare benefits, and go onto my full makeup routine from there. As you can see I definitely keep it simple and easy with my skin in the morning, which in my opinion makes my mornings more pleasureable! What skincare products do you use in the morning? I've actually never heard of any of these! I'll have to check them out. Great post! I have really dry skin too, and currently use a Cetaphil cleanser. Maybe I'll try the Caudalie cleansing water next. I love Nip + Fab products! They're so great! I have the Nip and Fab cleansing pads but yet to try them!! I need to because I always hear such good things. I love Caudalie products, they're some of my favorites! I really want to try that rose face mist it looks awesome! I always love to see the different skincare products people use! That Herbivore spray is amazing! So many great products! I need to try out that Herbivore Botanicals Rose Hibiscus Hydrating Face Mist. It sounds amazing!